The Major League Baseball Most Valuable Player Award (MVP) is an annual Major League Baseball (MLB) award, given to one outstanding player in the American League and one in the National League. Since 1931, it has been awarded by the Baseball Writers' Association of America (BBWAA). The winners receive the Kenesaw Mountain Landis Memorial Baseball Award, which became the official name of the award in 1944, in honor of the first MLB commissioner, who served from 1920 until his death on November 25, 1944. MVP voting takes place before the postseason, but the results are not announced until after the World Series. The BBWAA began by polling three writers in each league city in 1938, reducing that number to two per league city in 1961. The BBWAA does not offer a clear-cut definition of what "most valuable" means, instead leaving the judgment to the individual voters. First basemen, with 34 winners, have won the most MVPs among infielders, followed by second basemen (16), third basemen (15), and shortstops (15). Of the 24 pitchers who have won the award, 15 are right-handed while 9 are left-handed. 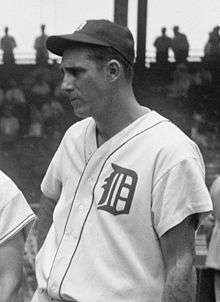 Walter Johnson, Carl Hubbell, and Hal Newhouser are the only pitchers who have won multiple times, Newhouser winning consecutively in 1944 and 1945. Hank Greenberg, Stan Musial, Alex Rodriguez, and Robin Yount have won at different positions, while Rodriguez is the only player who has won the award with two different teams at two different positions. 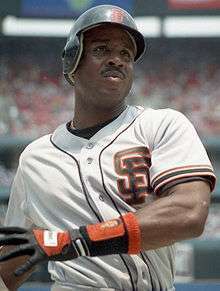 Barry Bonds has won the most often (seven times) and the most consecutively (2001–04). Jimmie Foxx was the first player to win multiple times; 9 players have won three times, and 19 have won twice. Frank Robinson is the only player to win the award in both the American and National Leagues. The award's only tie occurred in the National League in 1979, when Keith Hernandez and Willie Stargell received an equal number of points. There have been 17 unanimous winners, who received all the first-place votes. The New York Yankees have the most winning players with 22, followed by the St. Louis Cardinals with 17 winners. The award has never been presented to a member of the following four teams: Arizona Diamondbacks, Miami Marlins, New York Mets, and Tampa Bay Rays. The most recent recipients are Mike Trout in the American League and Kris Bryant in the National League. In recent decades, pitchers have rarely won the award. When Justin Verlander won the AL award in 2011, he became the first pitcher in either league to be named the MVP since Dennis Eckersley in 1992. Verlander also became the first starting pitcher to win this award since Roger Clemens had accomplished the feat in 1986. The National League went even longer without an MVP award to a pitcher—after Bob Gibson won in 1968, no pitcher in that league was named MVP until Clayton Kershaw in 2014. Before the 1910 season, Hugh Chalmers of Chalmers Automobile announced he would present a Chalmers Model 30 automobile to the player with the highest batting average in Major League Baseball at the end of the season. The 1910 race for best average in the American League was between the Detroit Tigers' widely disliked Ty Cobb and Nap Lajoie of the Cleveland Indians. On the last day of the season, Lajoie overtook Cobb's batting average with seven bunt hits against the St. Louis Browns. American League President Ban Johnson said a recalculation showed that Cobb had won the race anyway, and Chalmers ended up awarding cars to both players. The following season, Chalmers created the Chalmers Award. 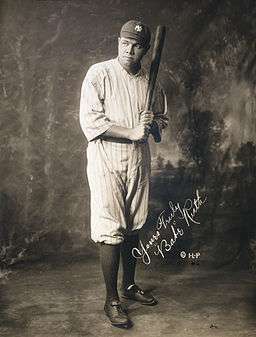 A committee of baseball writers were to convene after the season to determine the "most important and useful player to the club and to the league". Since the award was not as effective at advertising as Chalmers had hoped, it was discontinued after 1914. In 1922 the American League created a new award to honor "the baseball player who is of the greatest all-around service to his club". Winners, voted on by a committee of eight baseball writers chaired by James Crusinberry, received a bronze medal and a cash prize. Voters were required to select one player from each team and player-coaches and prior award winners were ineligible. These incredible flaws resulted in Babe Ruth only winning 1 MVP as the award was dropped after 1928. Under the All-Star Formula, Ruth would have won the MVP in 1920, 1921, 1923, 1925, 1928 and 1930 . The National League award, without these restrictions, lasted from 1924 to 1929. The BBWAA first awarded the modern MVP after the 1931 season, adopting the format the National League used to distribute its league award. One writer in each city with a team filled out a ten-place ballot, with ten points for the recipient of a first-place vote, nine for a second-place vote, and so on. In 1938, the BBWAA raised the number of voters to three per city and gave 14 points for a first-place vote. The only significant change since then occurred in 1961, when the number of voters was reduced to two per league city. 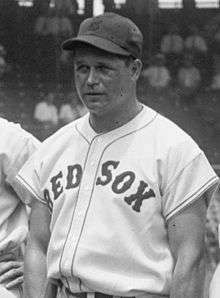 Jimmie Foxx was the first player to win three MVP awards. 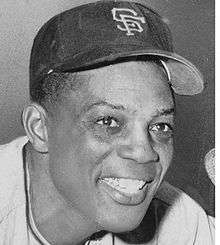 Hall of Famer Willie Mays won the award in 1954 and 1965 with the same team in different cities. Barry Bonds' seven MVPs are the most for any individual player. Alex Rodriguez won the award with two different teams at two different positions. 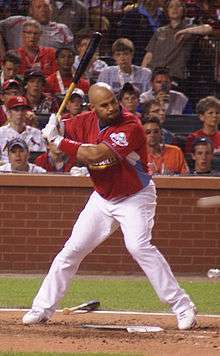 Albert Pujols won the award three times, all at first base with the St. Louis Cardinals. Miguel Cabrera was the winner of back-to-back AL Awards from 2012-13. Josh Donaldson won the AL MVP in 2015.
a A player is considered inactive if he has announced his retirement or not played for a full season. b A unanimous victory indicates that the player received all possible first-place votes. c Torre is a member of the Hall of Fame, but not as a player. He was inducted in 2014 as a manager. d Hernandez and Stargell both received 216 points in the 1979 voting. 1 2 "Landis, Kenesaw". National Baseball Hall of Fame and Museum. Retrieved 2011-11-22. ↑ Gillette, Gary; Palmer, Pete (2007). The ESPN Baseball Encyclopedia (Fourth ed.). New York: Sterling Publishing Co. p. 1763. ISBN 978-1-4027-4771-7. ↑ Kepner, Tyler (September 4, 2011). "Where Do You Find Value? Discussing the M.V.P. Criteria". The New York Times. p. SP3. Retrieved September 6, 2011. ↑ For the definition that appears on the BBWAA ballot (including pitchers and designated hitters), go to Voting FAQ and scroll down. Baseball Writers' Association of America. Retrieved November 7, 2016. 1 2 3 "Major League Baseball's Most Valuable Player Award Winners". Baseball Digest. Evanston, Illinois: Century Publishing Co. 59 (12): 86–89. December 2000. ISSN 0005-609X. Retrieved December 29, 2009. ↑ "Walter Johnson Statistics and History". Baseball-Reference.com. Retrieved 2016-01-23. ↑ "Alex Rodriguez Statistics". Baseball-Reference.com. Retrieved December 3, 2009. ↑ "Barry Bonds Statistics". Baseball-Reference.com. Retrieved December 3, 2009. ↑ "Jimmie Foxx Statistics". Baseball-Reference.com. Retrieved December 3, 2009. ↑ "Most Valuable Player MVP Awards & Cy Young Awards Winners". Baseball-Reference.com. Retrieved December 3, 2009. 1 2 3 "Baseball Awards Voting for 1979". Baseball-Reference.com. Retrieved December 28, 2009. ↑ Kepner, Tyler (November 21, 2011). "Verlander Is First Pitcher Named M.V.P. Since 1992". The New York Times. 1 2 "Clayton Kershaw, Dodgers". Baseball Writers' Association of America. Retrieved January 19, 2015. ↑ Doyle, Havey (July 4, 1941). "Mirrors of Sport". Pittsburgh Post-Gazette. p. 18. Retrieved January 19, 2010. ↑ Schwartz, Larry. "He was a pain ... but a great pain". ESPN.com. Retrieved January 19, 2010. ↑ "Baseball Awards Voting for 1911". Baseball-Reference.com. Retrieved December 3, 2009. ↑ "Baseball Awards Voting for 1912". Baseball-Reference.com. Retrieved December 3, 2009. ↑ "Baseball Awards Voting for 1913". Baseball-Reference.com. Retrieved December 3, 2009. ↑ "Baseball Awards Voting for 1914". Baseball-Reference.com. Retrieved December 3, 2009. ↑ Newman, Mark (November 14, 2009). "One of a kind: Another MVP for A-Rod". MLB.com. Retrieved December 5, 2009. ↑ Gould, Alan (December 8, 1929). "Rogers Hornsby Voted Most Valuable Player in National League". Reading Eagle. Retrieved January 6, 2010. ↑ "Player Award Goes to Hornsby again". The New York Times. December 8, 1929. p. S2. ↑ "Baseball Awards Voting for 1922". Baseball-Reference.com. Retrieved December 5, 2009. ↑ "Baseball Awards Voting for 1923". Baseball-Reference.com. Retrieved December 5, 2009. ↑ "Baseball Awards Voting for 1924". Baseball-Reference.com. Retrieved December 5, 2009. ↑ "Baseball Awards Voting for 1925". Baseball-Reference.com. Retrieved December 8, 2009. ↑ "Baseball Awards Voting for 1926". Baseball-Reference.com. Retrieved December 8, 2009. ↑ "Baseball Awards Voting for 1927". Baseball-Reference.com. Retrieved December 8, 2009. ↑ "Baseball Awards Voting for 1928". Baseball-Reference.com. Retrieved December 8, 2009. ↑ "Baseball Awards Voting for 1929". Baseball-Reference.com. Retrieved December 8, 2009. ↑ "Baseball Awards Voting for 1931". Baseball-Reference.com. Retrieved December 11, 2009. ↑ "Baseball Awards Voting for 1932". Baseball-Reference.com. Retrieved December 11, 2009. ↑ "Baseball Awards Voting for 1933". Baseball-Reference.com. Retrieved December 11, 2009. ↑ "Baseball Awards Voting for 1934". Baseball-Reference.com. Retrieved December 11, 2009. ↑ "Baseball Awards Voting for 1935". Baseball-Reference.com. Retrieved December 11, 2009. ↑ "Baseball Awards Voting for 1936". Baseball-Reference.com. Retrieved December 11, 2009. ↑ "Baseball Awards Voting for 1937". Baseball-Reference.com. Retrieved December 11, 2009. ↑ "Baseball Awards Voting for 1938". Baseball-Reference.com. Retrieved December 11, 2009. ↑ "Baseball Awards Voting for 1939". Baseball-Reference.com. Retrieved December 11, 2009. ↑ "Baseball Awards Voting for 1940". Baseball-Reference.com. Retrieved December 11, 2009. ↑ "Baseball Awards Voting for 1941". Baseball-Reference.com. Retrieved December 11, 2009. ↑ "Baseball Awards Voting for 1942". Baseball-Reference.com. Retrieved December 11, 2009. ↑ "Baseball Awards Voting for 1943". Baseball-Reference.com. Retrieved December 11, 2009. ↑ "Baseball Awards Voting for 1944". Baseball-Reference.com. Retrieved December 11, 2009. ↑ "Baseball Awards Voting for 1945". Baseball-Reference.com. Retrieved December 11, 2009. ↑ "Baseball Awards Voting for 1946". Baseball-Reference.com. Retrieved December 11, 2009. ↑ "Baseball Awards Voting for 1947". Baseball-Reference.com. Retrieved December 11, 2009. ↑ "Baseball Awards Voting for 1948". Baseball-Reference.com. Retrieved December 11, 2009. ↑ "Baseball Awards Voting for 1949". Baseball-Reference.com. Retrieved December 11, 2009. ↑ "Baseball Awards Voting for 1950". Baseball-Reference.com. Retrieved December 11, 2009. ↑ "Baseball Awards Voting for 1951". Baseball-Reference.com. Retrieved December 11, 2009. ↑ "Baseball Awards Voting for 1952". Baseball-Reference.com. Retrieved December 11, 2009. ↑ "Baseball Awards Voting for 1953". Baseball-Reference.com. Retrieved December 11, 2009. ↑ "Baseball Awards Voting for 1954". Baseball-Reference.com. Retrieved December 11, 2009. ↑ "Baseball Awards Voting for 1955". Baseball-Reference.com. Retrieved December 11, 2009. ↑ "Baseball Awards Voting for 1956". Baseball-Reference.com. Retrieved December 11, 2009. ↑ "Baseball Awards Voting for 1957". Baseball-Reference.com. Retrieved December 11, 2009. ↑ "Baseball Awards Voting for 1958". Baseball-Reference.com. Retrieved December 11, 2009. ↑ "Baseball Awards Voting for 1959". Baseball-Reference.com. Retrieved December 11, 2009. ↑ "Baseball Awards Voting for 1960". Baseball-Reference.com. Retrieved December 11, 2009. ↑ "Baseball Awards Voting for 1961". Baseball-Reference.com. Retrieved December 11, 2009. ↑ "Baseball Awards Voting for 1962". Baseball-Reference.com. Retrieved December 11, 2009. ↑ "Baseball Awards Voting for 1963". Baseball-Reference.com. Retrieved December 12, 2009. ↑ "Baseball Awards Voting for 1964". Baseball-Reference.com. Retrieved December 12, 2009. ↑ "Baseball Awards Voting for 1965". Baseball-Reference.com. Retrieved December 12, 2009. ↑ "Baseball Awards Voting for 1966". Baseball-Reference.com. Retrieved December 12, 2009. ↑ "Baseball Awards Voting for 1967". Baseball-Reference.com. Retrieved December 12, 2009. ↑ "Baseball Awards Voting for 1968". Baseball-Reference.com. Retrieved December 12, 2009. ↑ "Baseball Awards Voting for 1969". Baseball-Reference.com. Retrieved December 12, 2009. ↑ "Baseball Awards Voting for 1970". Baseball-Reference.com. Retrieved December 12, 2009. ↑ "Baseball Awards Voting for 1971". Baseball-Reference.com. Retrieved December 12, 2009. ↑ "Baseball Awards Voting for 1972". Baseball-Reference.com. Retrieved December 12, 2009. ↑ "Baseball Awards Voting for 1973". Baseball-Reference.com. Retrieved December 12, 2009. ↑ "Baseball Awards Voting for 1974". Baseball-Reference.com. Retrieved December 28, 2009. ↑ "Baseball Awards Voting for 1975". Baseball-Reference.com. Retrieved December 28, 2009. ↑ "Baseball Awards Voting for 1976". Baseball-Reference.com. Retrieved December 28, 2009. ↑ "Baseball Awards Voting for 1977". Baseball-Reference.com. Retrieved December 28, 2009. ↑ "Baseball Awards Voting for 1978". Baseball-Reference.com. Retrieved December 28, 2009. ↑ "Baseball Awards Voting for 1980". Baseball-Reference.com. Retrieved December 28, 2009. ↑ "Baseball Awards Voting for 1981". Baseball-Reference.com. Retrieved December 28, 2009. ↑ "Baseball Awards Voting for 1982". Baseball-Reference.com. Retrieved December 28, 2009. ↑ "Baseball Awards Voting for 1983". Baseball-Reference.com. Retrieved December 28, 2009. ↑ "Baseball Awards Voting for 1984". Baseball-Reference.com. Retrieved December 28, 2009. ↑ "Baseball Awards Voting for 1985". Baseball-Reference.com. Retrieved December 28, 2009. ↑ "Baseball Awards Voting for 1986". Baseball-Reference.com. Retrieved December 28, 2009. ↑ "Baseball Awards Voting for 1987". Baseball-Reference.com. Retrieved December 28, 2009. ↑ "Baseball Awards Voting for 1988". Baseball-Reference.com. Retrieved December 28, 2009. ↑ "Baseball Awards Voting for 1989". Baseball-Reference.com. Retrieved December 28, 2009. ↑ "Baseball Awards Voting for 1990". Baseball-Reference.com. Retrieved December 28, 2009. ↑ "Baseball Awards Voting for 1991". Baseball-Reference.com. Retrieved December 28, 2009. ↑ "Baseball Awards Voting for 1992". Baseball-Reference.com. Retrieved December 28, 2009. ↑ "Baseball Awards Voting for 1993". Baseball-Reference.com. Retrieved December 28, 2009. ↑ "Baseball Awards Voting for 1994". Baseball-Reference.com. Retrieved December 28, 2009. ↑ "Baseball Awards Voting for 1995". Baseball-Reference.com. Retrieved December 28, 2009. ↑ "Baseball Awards Voting for 1996". Baseball-Reference.com. Retrieved December 28, 2009. ↑ "Baseball Awards Voting for 1997". Baseball-Reference.com. Retrieved December 28, 2009. ↑ "Baseball Awards Voting for 1998". Baseball-Reference.com. Retrieved December 28, 2009. ↑ "Baseball Awards Voting for 1999". Baseball-Reference.com. Retrieved December 28, 2009. ↑ "Baseball Awards Voting for 2000". Baseball-Reference.com. Retrieved December 28, 2009. ↑ "Baseball Awards Voting for 2001". Baseball-Reference.com. Retrieved December 28, 2009. 1 2 "Albert Pujols of St. Louis Cardinals is unanimous National League MVP". ESPN. The Associated Press. November 25, 2009. Retrieved July 14, 2010. ↑ "Baseball Awards Voting for 2002". Baseball-Reference.com. Retrieved December 28, 2009. ↑ "Baseball Awards Voting for 2003". Baseball-Reference.com. Retrieved December 28, 2009. ↑ "Baseball Awards Voting for 2004". Baseball-Reference.com. Retrieved December 28, 2009. ↑ "Baseball Awards Voting for 2005". Baseball-Reference.com. Retrieved December 28, 2009. ↑ "Baseball Awards Voting for 2006". Baseball-Reference.com. Retrieved December 28, 2009. ↑ "Baseball Awards Voting for 2007". Baseball-Reference.com. Retrieved December 28, 2009. ↑ "Baseball Awards Voting for 2008". Baseball-Reference.com. Retrieved December 28, 2009. ↑ "Baseball Awards Voting for 2009". Baseball-Reference.com. Retrieved December 3, 2009. ↑ "Rangers Outfielder Josh Hamilton Honored". Baseball Writers' Association of America. Retrieved November 23, 2010. ↑ "Reds' Joey Votto Runs Away With Award". Baseball Writers' Association of America. Retrieved November 22, 2010. ↑ "Justin Verlander Completes Rare Double, Adding MVP to Cy Young". Baseball Writers' Association of America. Retrieved November 21, 2011. ↑ "Ryan Braun Slugs His Way to Award". Baseball Writers' Association of America. Retrieved November 22, 2011. ↑ "Mike Trout Highest WAR at Youngest Age". Baseball Writers' Association of America. Retrieved November 15, 2012. ↑ "YadierMolina". Baseball Writers' Association of America. Retrieved March 13, 2013. ↑ "Miguel Cabrera Goes Back-to-Back". Baseball Writers' Association of America. Retrieved November 14, 2013. ↑ "Andrew McCutchen Wins Pirates' 1st MVP since 1992". Baseball Writers' Association of America. Retrieved November 14, 2013. ↑ "Mike Trout, Angels". Baseball Writers' Association of America. Retrieved January 19, 2015. ↑ "Josh Donaldson, Blue Jays". Baseball Writer's Association of America. Retrieved November 7, 2016. ↑ "Bryce Harper, Nationals". Baseball Writers' Association of America. Retrieved November 7, 2016. ↑ "Baseball Hall of Fame Inductees". Baseball-Reference.com. Retrieved December 3, 2009. ↑ "Joe Torre". National Baseball Hall of Fame and Museum. Retrieved November 13, 2014. Most Valuable Player MVP Awards & Cy Young Awards Winners (1911–present) (and "Multiple Winners of the MVP and Cy Young Awards"). Baseball-Reference.com. Retrieved 2016-11-07.